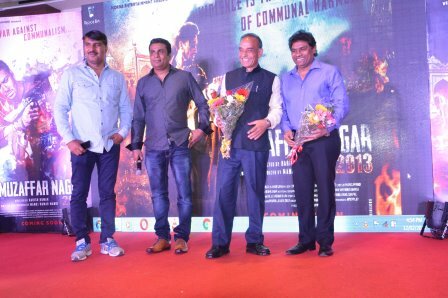 Former Police Commissioner of Mumbai and currently MP from Baghpat city in Uttar Pradesh Satyapal Singh and well known comedian Johny Lever graced the grand occasion of trailer launch of Hindi feature film “MUZAFFAR NAGAR 2013” on 12th February 2017 at Hotel Novotel in Juhu. Beside them occasion was also graced by entire cast and credits of film and media persons. Writer /Producer Manoj Kumar Mandi belongs to Muzaffar Nagar and has won the award of being best farmer in country, as he is witness to real incident occurred in his city in 2013 he decided to make a film on it, and with help of his friend director Harish Kumar (earlier film ‘Pakda Pakdi’ in Marathi) he managed to bring this movie in just 3 schedule at real locations . Harish Kumar said he has made the film on real incident but with blend of romance, message and thrills, he added ‘we have tried to send a strong message to audience that nothing is bigger the religion of Humanity. Chief guests Satyapal Singh, Johny Lever also appreciated the effort of the makers. Film has been made under the banner of ‘Morna Entertainment Pvt. Ltd’, Written & produced by Manoj Kumar Mandi, directed by Harish Kumar, music by Manoj Nayan, Rahul Bhatt and Faraaz Ahmed, Dop Ravi Kumar Sana and editing by Saju Chandran. Film stars Dev Sharma, Aishwarya Devan, Ekansh Bhardwaj, Anil George, Mursaleem Qureshi, Sandip Bose and Ravi Khanna. Film will be releasing on 7th April 2017 all over.